Which should you choose? eBook or Print? The good news: For most of our courses, you can choose between purchasing the eBook format or the print edition. The bad news: You have to choose between the eBook format and the print edition. In this corner . . . weighing in over one pound, and requiring the service of planes, trains, and/or automobiles—we have Print. Tangible. You can hold it, feel it, listen to the pages flip, smell it (when no one’s looking), liven up a bookshelf, and throw it at your brother (and if it’s Biology 2, it’ll hurt). No setup required. No need for a printer, expensive ink cartridges, and loads of patience dealing with paper jams while trying to print out worksheets and maps. Hearty. Have you heard the giggle coming from your bookshelf as your computer crashes? That’s Print by a knockout. While in this corner . 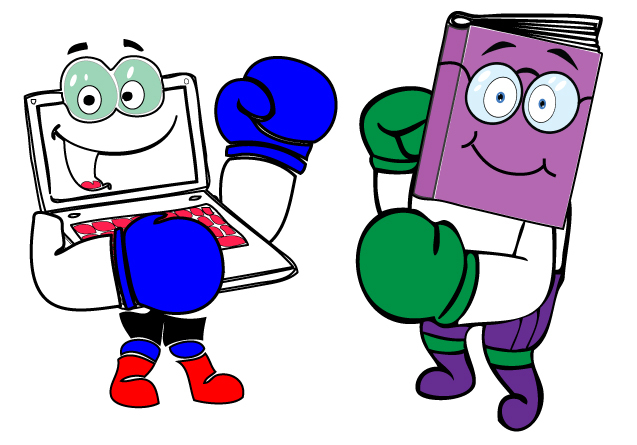 . . weighing in at nothing, and requiring a high-speed Internet connection—we have eBook. Instantaneous. Faster than you can say, “I’m delayed gratification-challenged,” your eBook download link is in your Inbox. Cheaper. eBooks cost significantly less than their print counterparts, and don’t forget: none of those pesky shipping & handling fees. Interactive. eBooks are social. (And that’s a big deal—right, homeschoolers?) eBooks are easy to navigate, search, and make Internet research a breeze. Forgiving. If your child feeds his worksheet to the dog, no problem—just smile and print another one. Based on this list, you might think eBook wins. But not so fast, our sales of eBook vs. print are 50/50. I think it is mostly a personal preference; but I have found that some titles work better as one format over the other. For RSO Biology 2 and Astronomy 2 (the student texts) and History Odyssey Level 2 courses, I prefer Print. Why? RSO Biology 2 is a whooper of a course that combines textbook, lab manual, workbook, and test bank all in one huge spiral-bound book. The pages that the student writes on are scattered throughout the course and are numerous. Almost the entire eBook would have to be printed out, and at 754 pages . . . well, this one is also Print by a knockout! For RSO level one and History Odyssey Level 1 courses, I prefer eBook. Also, for RSO Biology 2 Teacher Guide and RSO Astronomy 2 Teacher Guide, I prefer eBook. Why? 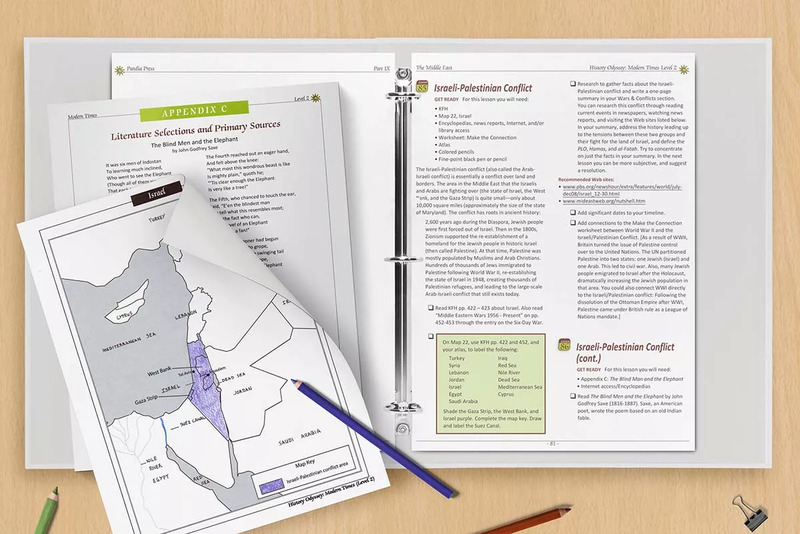 RSO level one and History Odyssey level one books are really teacher guides with student worksheets. I find it easiest to keep the teacher pages on my computer screen and print out the student worksheets and maps (one for each of my children). RSO Biology 2 Teacher Guide and RSO Astronomy 2 Teacher Guide can be used easily from a computer screen. There is no need to print out any pages, and the use of a little color does help with evaluating some of the microscope views and answer keys. Also, there are numerous website links in these books that are accessed with a click of the mouse in the eBook versions. History Odyssey Modern Times 2 Teacher Guide is only available as an eBook. This is because of its size, Internet connections, and the fact that color is instructionally significant for maps and worksheet answer keys. 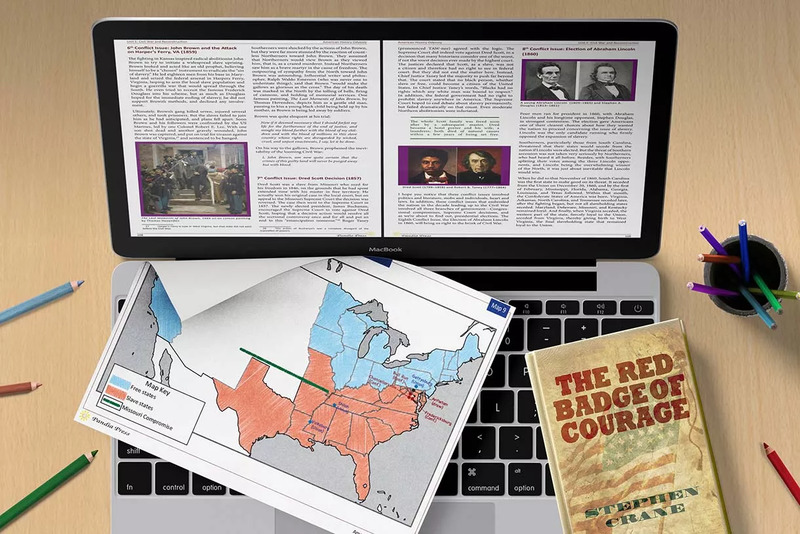 At this time, American History Odyssey (teacher and student) and The Stargazer’s Notebook are only available as eBooks. But print editions are planned for the near future, so don’t think you got out of making that decision so easy! Now your eBook/Print decision is as clear as day. If it’s still mud, then flip a coin—you really can’t lose.